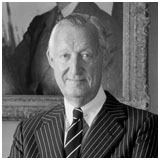 Paul Mellon KBE (1929), born 11 June 1907, was a philanthropist, art collector and racehorse owner. He was co-heir to the Mellon Bank - one of America’s greatest business fortunes. In 1957, when Fortune prepared its first list of the wealthiest Americans, he was reckoned among the eight richest people in the United States. His lifelong philanthropy was focussed especially on Yale, where he was a principal benefactor of Yale College, and Cambridge, where he made substantial donations to Clare College, Clare Hall and the Fitzwilliam Museum. Paul came up to Clare in 1929, studying as an undergraduate after graduating from Yale earlier that year. He was a founding member of the CRABS (Clare Rugby and Boating Society) which is still (very much!) active today. A year after graduating from Clare, he established the Mellon Fellowships, permitting the reciprocal exchange of two students from Yale and Clare each year for graduate study, which continue to this day. He also gave a major benefaction to establish the Forbes-Mellon Library, opened in 1986. A noted connoisseur of the arts, he built up one of the finest private collections of British paintings in the world, which he donated to Yale along with the funding to create the Yale Center for British Art, and attributed his great love of England and English culture to his time spent at Clare: "It was while I was at Cambridge that I embarked on the dangerous seas of collecting" he once said. He also added to his father’s donations to the National Gallery of Art in Washington DC, commissioning and funding the gallery’s East Wing. Paul was a lifelong lover of horse-racing and owned many thoroughbreds, including Sea Hero (winner of the Kentucky Derby) and Mill Reef (winner of the Epsom Derby and the Prix de l’Arc de Triomphe). He was elected to an Honorary Fellowship of Clare College in 1960 and made an Honorary KBE in 1974. He died on 1 February 1999.